Dr. Ernst Stuhlinger, one of the last surviving members of the 126 German rocket scientists brought over to the United States after world war II has passed away quietly in Huntsville Alabama. Dr. Stuhlinger was 94 years old. "Dr. Ernst Stuhlinger (born December 19, 1913) was an American atomic, electrical and rocket scientist born in Niederrimbach, Germany. 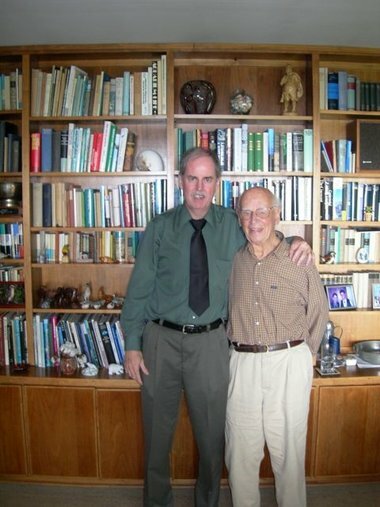 He earned his Ph.D. in physics at age 23, and in 1939 went to work for the German Atomic Energy Program. In 1943, he joined Dr. Wernher von Braun's team at the German village of Peenemuende, where he worked in the field of guidance systems. He was one of 126 scientists who immigrated to the United States with Dr. von Braun after World War II as part of Operation Paperclip. On April 14, 1955, he became a naturalized United States citizen. In the 1950s Stuhlinger worked at the Redstone Arsenal, where he developed designs for solar-powered spacecraft. The most popular of those designs relied on ion stream vapor emitted by either caesium or rubidium atoms to be accelerated by negatively charged electrodes which would push the ion stream through a propulsion channel. The mechanism would be powered by the one kilowatt of radiant energy that falls on each square meter of space from the sun. He referred to it as a "sunship." Stuhlinger was director of the space science lab at NASA's Marshall Space Flight Center in Huntsville, Alabama, from 1960 to 1968, and then its associate director for science from 1968 to 1975, when he retired and became an adjunct professor and senior research scientist at the University of Alabama in Huntsville." I met Dr. Stuhlinger in 1988 in Huntsville when he was working in his retirement at Teledyne Brown Engineering. At the time he was working on a drop tower which is a tower with a vacuum in the middle where a few seconds of microgravity can be generated as the experiment falls from the top to the bottom. Dr. Stuhlinger's greatest accomplishment was to be one of the key inventors of ion propulsion, which is an ultra efficient means of generating thrust in space to move spacecraft around. The first mission to use this technology was the Space Electric Rocket Test (SERT) in the early 1970's. NASA's Deep Space 1 spacecraft, launched in 1998 depended on ion propulsion for its missions. Many Russian and American missions have used electric thrusters in the past twenty years to conserve fuel and extend the life of GEO spacecraft. 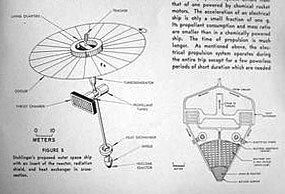 Dr. Stuhlinger designed the first manned ion propulsion system for sending humans to Mars as far back as 1958 (a scanned image is shown here) and by the 1970's he and Von Braun were convinced that ion propulsion would open up the solar system for exploration. This dream is very slowly being realized. My own interest in ion propulsion was stimulated by Dr. Stuhlinger and today I tip my hat to him and those of his generation that helped to build the rockets that put mankind on the Moon.